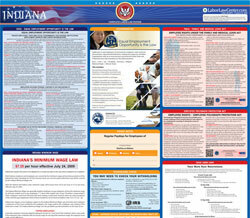 The IOSHA Poster (Spanish) is a job safety law poster by the Indiana Department Of Workforce Development. This is a mandatory posting for all employers in Indiana, and businesses who fail to comply may be subject to fines or sanctions. This poster, written in Spanish, must be posted in a conspicuous place where all employees will see it. This poster describes the safety conditions in which employers need to uphold, as well as employees rights should they feel that their workplace is not safe enough, and penalties that employers will pay if they do not uphold safety and health standards. It appears you don't have a PDF plugin for this browser. Please see the link below to download indiana-spanish-poster.pdf.